* this post is part of january’s synchroblog, which is centered on serving others in 2013. i always like the synchroblog because it challenges me to think about certain topics in new ways. i wanted to start a new series in 2013 of shorter posts that are called “three things about one word” and i thought this would be a good one to start with. serving. when you hear that word, what does it stir up in you? for some, it’s a positive word, an encouraging one. you have a huge heart for serving others & it is an inspiring word. for others it can hit a nerve because of some of our past church experiences where there have been demands made and expectations placed on us and so serving came from a place of obligation, not freedom. for me, i’m not crazy about the word (for some of the same reasons the word “missional” bugs me) but i believe wholeheartedly in the message behind it. 1. if we’re not careful, “serving others” can be a way to stay protected and one-up from others. it can imply “we’re here to give to these poor unfortunate ones” instead of “we are all equals and i have something to receive, too” most everyone i know has a heart to “serve” but not everyone is open to receiving. for me, i am way better at giving than receiving, and i have a natural default to the preposition “for” if i’m not careful. “with” relationships restore dignity and foster transformation for both sides while “to” and “for” ones keep power protected. 2. a better word for “serving”is “caring”. to me, when i picture serving, i see someone scooping out food in a food line, with a big plastic barrier between “us” and “them.” i know it’s not always like that, but it really is the easiest way to help. when we care for others, it doesn’t mean we have to be in the thick of deep crazy relationship with each other (although we might be) but it means it’s more human. to care means there’s a connection beyond a transaction. 3. what if we thought of serving & caring for others not as an activity once a week or once a month but as a natural & ordinary part of our lives. that means that we don’t only look for organizations to volunteer for (although of course that can be part of it) but also made a shift to notice what we might not have noticed before and actively respond. what if we made the invisible visible in all kinds of simple and small ways and developed Jesus-y eyes, the kind that can see beyond the surface. rich, poor, black, white, there’s a a lot of pain & desperation out there that a little kindness & simple presence can heal. how about a conversation instead of a simple hello, a cup of cold water instead of writing a check, noticing who might be lonely and paying them a visit, or an “i believe in you” for the weary soul. in the year ahead, i am not trying to think of ways to “serve” more but i do want to keep learning what it means to live out the ways of Jesus in ongoing freedom & joy. these three things can help me. i want to practice receiving as much as giving and knowing hearts and people instead of tasks and being open to passing on small kindnesses instead of big activities. what are you learning about serving? I’m learning that it is very easy to see serving as condescending, giving to who have “less than” you and somehow the idea that they ARE “less than you” creeps in … so i love what you said about “with” … I’m not a fan of the word serving, for some of the reasons you mentioned … serving the Lord, serving the church, all was based on time put in and productivity somehow, and especially those things which were visible and measurable. I prefer the idea of simple incarnation, which is most often just showing up and being present, truly present. Recently, I was visiting my Mom in her nursing home and her roommate was sitting by the drinking fountain crying out “water! water!” Staff was busy and passing her by, because crying out all day is her way of life. She had become invisible through her repeated cries. I checked to make sure that water was safe for her (it isn’t for all) and they said it was. Went to the nurse’s cart, got a paper cup, and filled it from the drinking fountain. Held it to her mouth as her hands were too shaky to hold it. And burst into tears as the verses “a cup of cold water given in my name” and “as you have done it to the least of these, you’ve done it to me” were burned into my heart. oh my friend, that is a powerful (and painful) story. thank you for sharing it. i can feel that moment and it makes me cry, too. i, too, prefer the idea of simple incarnation, as you said, “which is most often just showing up and being present, truly present.” that’s plenty. love from colorado. Yes, the word “serving” can sometimes give the wrong idea. The words we hear: “remembering us”, “not forgetting us”, “caring”, “loving us”, “we love you”, “good neighbor”, “friend”, “helper”,”listening”, “being there”. These words indicate equality, relationship and loving. I’d guess you’ve also heard those words Kathy. i love all those words! That was helpful – yes gettgin past the word “serve” as if that earns us some points into heaven when in fact we want to be perceived well by others as our motivation – our ego. Or alternatively the idea that it leads to life sapping servility rather than thr freedom empowering and privelidege to be part of God’s actions in the world. And yet – things like serving and being missional are central to faith in Jesus. So we have to live with this vocabulary. Perhpas part of being in the image of God is being creative with these central principles in terms of the words we use with each other that is relevent to any particular context? Also there is the flip side of course. I’ve heard the words “we love you and we value you” yet at a time of need and difficulty where challenges are expereinced I’ve heard a pastor say that the church he lead is “not for you”. So I come with my own preconcieved ideas to new situations with being suspicious about what people say. I need to see the fruit not just the words and I think truthfully that is what most people need too. You are welcome Irene. All the best with sacrificing the ego, keeping Christ central and with the “God swoops” :). Glad you like it Kathy. Your thoughts about “serving” remind me of my own response to “needy.” The idea that we’re going to “help the needy” makes my skin crawl. We’re all needy – in different ways, different needs. And help comes in many forms. I love the idea of “Jesus-y” eyes – that see past the definitions, barriers, labels, assumptions. “With” is such a huge, important word. I’m longing for people to walk “with” me – and looking for ways to walk with others. oh that bugs me, too. we have also been taught that “needy” is bad instead of embracing how deeply we truly do “need” each other…i appreciate all of your thoughts, thank you for sharing . I really like this, Kathy! Somehow we have made what ought to be a normal part of our life into something special and extraordinary. The more real and normal we can make loving like Jesus, the better. It’s just living and loving. thanks glenn. yeah, we are masters at separating out what’s spiritual, what’s not. i am looking forward to reading everyone’s posts. i’ll be in chicago at the end of april for the sacred friendship gathering. it would be so fun to see you! I used to view not just serving, but all of charity, as a transaction between someone who “has” with someone who “has not”. I now see how paternalistic that thinking really is. I now see and experience charity as an inter-action, not a trans-action. A trip to the DR working alongside Haitian refugees changed all that. I now see Matthew 25:35 in an entirely new light. Jim – thanks for sharing the link to your site. 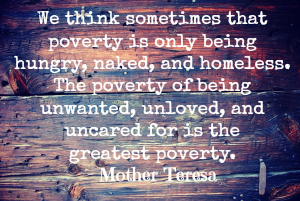 Your up close view of poverty was moving – and challenging. It would have made – or I guess did make – a great addition to our synchroblog conversation. Ad it illuminated what kathy says here. thanks. It has been my pleasure. Now if someone could explain why I still weep when I read it … after the hundredth time. It still tears at my worldview, stretches it, expands it out till it hurts … in a good way. I guess. Maybe. On second thought, I really don’t want an explanation as to why. Whatever the Spirit is molding in my soul with the groans and teardrops of my heart will be good. And I’m OK with that. that is such a beautiful piece, jim. that’s what I want to do!! – make it a natural & ordinary part of my life! Sometimes that is easier said than done. You may think that my idea about coming up with little ways I can show kindness throughout the year is nothing more than a list I can check off and I even worried about that when I came up with the idea but my desire is that these “kindness appointments” on my calendar will help me to “become” what I want to be … someone who loves others, someone who connects with others, someone who makes others feel loved and valued. I am also glad that you talked about how our “serving” often sets us up in a superior or at the very least, separate position and how many of us need to work on learning to receive. I wish all of these things came naturally to me but I tend to get focused on myself unless I am continually practicing something that takes my eyes off of myself. What can I say … I’m a work in progress. PS Sorry it took me so long to get around to reading the January synchroblog posts.